The wind was whipping the water into white spray as the surf rolled in on the beach and the only visible birds were a dozen Black Oystercatchers huddled in the lee of a small rocky island. A lone gull struggled to get airborne off the beach and was blown around like a leaf in the wind. Like a bolt of lighting another unseen bird from high in the sky shot down on the gull with exact precision, as if there was no wind at all. Its flight and angle did not waver, and it seemed certain the gull would be hit. The Oystercatchers froze in silence and it seemed as if the whole world held its breath for a moment. At the very last second, the falcon veered off in a smooth controlled arc, as if enjoying the rush of speed and power. The Peregrine Falcon could have easily killed the gull, but it was a young falcon and was probably just practicing its dives. After its mock attack on the gull the Peregrine rose high over the big spruce trees and amazingly remained suspended, facing the roaring wind, maintaining a steady position in a wind that had now blown the hat right off my head! Peregrine Falcons migrate through the Tofino area in fall and early winter, and then pass through here again in late winter and spring. While they do not breed in Tofino, they do nest in some other areas of the coast. In fact the highest concentration of breeding Peregrines in the world is on the British Columbia coast in Haida Gwaii (Queen Charlotte Islands). Two separate subspecies are seen here: The Peale’s and a Tundra variety, the latter being much lighter. Peregrines are the largest of our three falcon species. They are 38 to 50 cm tall, with pointed wings and tails and a prominent dark “mustache” on the face. So streamlined are Peregrines that they are considered the fastest birds in the world. Individuals have been clocked at 100 miles per hour in straight flight, and at 250 miles per hour in a dive. Their diet in our area is made up largely of ducks, shorebirds, and seabirds. The Merlin is our second smallest falcon and this species uses stealth in its hunting method much more than the Peregrine. Merlins feed on small songbirds and shorebirds and are often seen in open areas and beaches. Capable of bursts of high speed, this falcon will chase a large group of sandpipers and single out one bird, separating it from the large flock. After a short mid air chase, when the weakened sandpiper tries to fly it is forced to dive underwater to escape the agile hawk. Eventually the exhausted sandpiper is picked up off the surface of the water by the circling Merlin. Our third and smallest falcon is the Kestrel. This is a delicate hawk slightly larger than a jay, it feeds on insects and small mammals. The male is magnificent, with a warm buffy breast, contrasting with blue wings and a rufous back and tail. Females lack the blue of the males. They catch their prey by hovering in mid-air like a Kingfisher, or sitting motionless on a fence post or wire in open country, then swooping down when detecting motion. Their habitat is open country of fields, where their shrill call of kli kli kli kli kli kli can be heard. On the west coast we find Kestrels at the golf course and the airport. Even the fabled Peregrine Falcon occasionally loses its prey to the marauding Bald Eagles. One morning I watched as a Peregrine swooped and pinned down an unwary snipe in the grass on the Tofino mudflat. Before I could raise my binoculars a Bald Eagle had swooped down on the snipe. The eagle pushed the falcon from his spot on the ground, grabbed the snipe and flew away with his prize. Falcons can distinguished by their long pointed wings, straight tails, and short rounded head. Other bird species have similar shapes and sometimes doves and gulls may initially appear to be a flying falcon. A close look for the fast, strong flight and rapid wingbeats will quickly show the difference. The spirit of the falcon is epitomized by the wind bending the spruce tops and the constant roar of the surf pounding the beach – birds of pure speed and power that take your breath away! 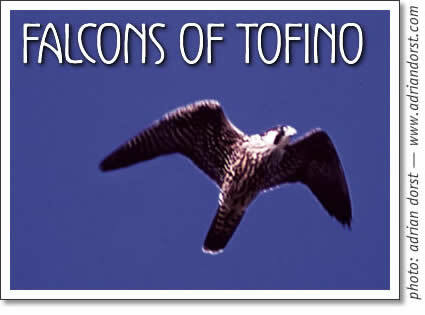 Tofino bird watching article about Peregrine Falcons and their habitat in Tofino, Canada. Written by Tofino birding guide George Bradd in Tofino.